DDHS students can win some of these great prizes for displaying positive behaviors. If a student commits a major rules violation at DDHS, the result is typically an office referral to see one of the associate principals, Mr. Lodahl or Mr. Parker. And fortunately — for both DDHS students and the staff in the associate principals’ office suite — there have been far fewer of those visits this year compared to last year. For those of you counting at home, that’s more than 100 fewer referrals for disrespect, and three times fewer referrals for misuse of technology. Tobacco referrals are a quarter of what they were, drugs, about half. Harassment is about a third of what it was in 2011-12, and disruptions were cut in half compared to the year before. Eighteen fewer office referrals were made for skipping/cutting classes. Added up, the total referrals are far fewer than they were last school year! Judging by the data, the Comet Code appears to be working quite well as students are reminded often of the common set of expectations we have for them, and are recognized and rewarded for displaying positive behavior that sets an example for their peers. In fact, DDHS will have a Comet Code assembly tomorrow (Friday, May 24) at the end of the day to celebrate our successes this year. Students can turn in their “Comet Cash” to be eligible for these end-of-the-year drawings for prizes. 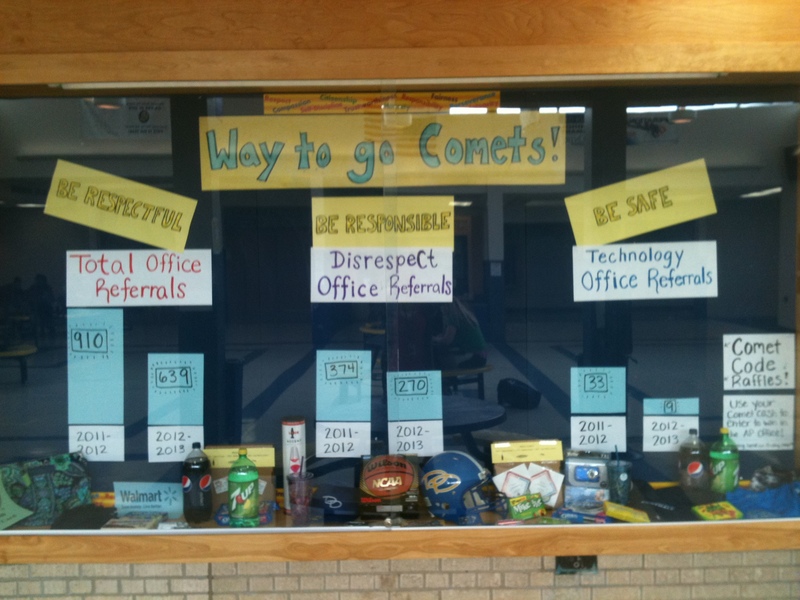 Comet Cash is awarded to students when they are “caught” doing the right thing. There is a lot they can win. We have DDHS apparel, a DDHS football helmet, a basketball, Walmart gift cards ($50 each), Starbucks gift card, purses, pizza prizes, candy, a big blue bean bag chair, and more. Students should use all the Comet Cash they have as there will not be any more opportunities for school-wide incentives the rest of the year.